Biotech has produced numerous stocks recently that have doubled or tripled in short periods of time. 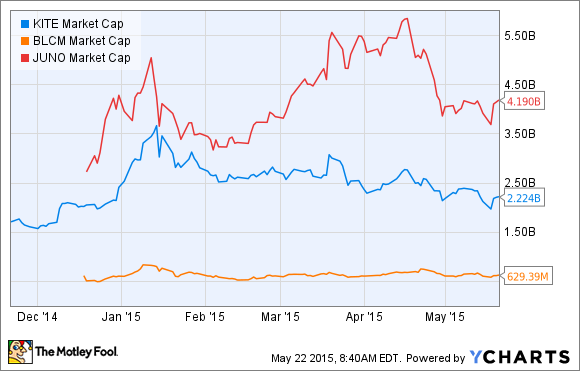 Here is a look at three small-cap companies with the potential to continue this trend. For investors looking for ways to double or triple their money in short order, there probably isn't a better area than biotech. Biotech stocks have dominated the list of best-performing stocks over the last couple of years, largely because of an ongoing innovation boom that is bringing a diverse array of game-changing new drugs to market. If we push past the general label of biotech stock, though, we can see that the biggest gains have been among clinical-stage companies -- some of which have more than tripled in the past year. And that's where the problem for investors lies: developmental stage biopharmas often tend to be feast or famine types of investments. If a company's lead product candidate successfully navigates the lengthy clinical testing process and subsequently gains regulatory approval, its stock can shoot higher. On the other hand, a failure at any point along the way can cause shares to collapse. Keeping this in mind, here is a look at three biotech stocks that could easily double if things go their way -- or break the hearts of investors hoping to catch lightening in a bottle. 1. Bellicum Pharmaceuticals (NASDAQ: BLCM) is an under-appreciated name in the CAR-T cancer therapy space worth watching. The company is taking a unique approach toward solving the toxicity and efficacy issues that have plagued the development of this promising form of cancer treatment through the use of molecular switches that can be triggered by a small molecule called rimiducid. In theory, these switches could be used to either "amp up" a therapeutic response or "turn-off" the modified cells if a patient is having an adverse reaction. 2. Exelixis (NASDAQ: EXEL) is an oncology company with two pivotal upcoming catalysts. Before the end of this quarter, the company should release topline results from the ongoing Meteor clinical trial testing Cometriq against Novartis' Afinitor in patients with kidney cancer. If this trial is successful, it could be a nice opportunity given that the renal cell carcinoma market is expected to reach $2.7 billion by 2019. Even a small slice of that market could be a nice opportunity for the company. In the third-quarter -- on or before Aug. 11, to be exact -- Exelixis and its marketing partner Roche should learn the fate of their experimental advanced melanoma drug cobimetinib, indicated for patients expressing the BRAF V600 mutation, from the Food and Drug Administration, or FDA. While approval wouldn't result in major windfall for the company based on the terms of its licensing agreement with Roche, it does provide some insurance for investors in case Cometriq's kidney cancer trial fails. 3. Sarepta Therapeutics (NASDAQ: SRPT) is a clinical-stage biopharma working on a closely watched treatment for Duchenne muscular dystrophy. The treatment, eteplirsen, works by skipping faulty patches of DNA, thereby helping to restore levels of a key protein, dystrophin, that is deficient in boys afflicted with this devastating disease. Although the drug has only completed a small midstage study, the results might be promising enough to warrant an accelerated approval. So, getting right to the point, if eteplirsen were to be approved later this year, it could see peak sales of around $500 million at some point. That would be a monstrous catalyst for a company that currently sports a market cap of about $1 billion. Looking ahead, eteplirsen's regulatory review is anything but a slam dunk. After all, some of the boys receiving the treatment showed a marked decline in walking ability at the 168-week data readout in the open-label portion of the study. And the FDA may not feel comfortable approving a drug based on a study with a mere 12 patients. Are any of these stocks buys right now? Bellicum and Exelixis offer at least a small buffer against complete disaster because they look so under-valued already. Specifically, Bellicum's experimental pipeline is diverse enough that it should be able to withstand some early setbacks. Exelixis, by contrast, has an approved product in Cometriq that should help it at least stay afloat if its Meteor trial fails and/or cobimetinib is rejected by the FDA. Sarepta, though, is the quintessential all-or-nothing biotech. Eteplirsen's approval would unlock tremendous latent value in the company's remaining DMD platform. By the same token, a rejection would likely be devastating for its prospects going forward. So, among these three stocks, Bellicum and Exelixis probably offer the best risk to reward ratio, making them worth a deeper dive for risk-tolerant investors. Sarepta, on the other hand, might best be viewed as a watchlist candidate until the FDA makes a final decision on eteplirsen's regulatory fate.